On the highest-scoring day of World Cup knockout football since 1970, two of the greatest players of all time failed to find the net. For Lionel Messi and Cristiano Ronaldo, their inability to make decisive impacts in their teams' last-16 matches means their tournaments - and perhaps their hopes of claiming the game's biggest prize - are over. Defeats for Argentina against France, and Portugal against Uruguay, leave the pair - aged 31 and 33 respectively - knowing the chances that they will ever be able to call themselves World Cup winners have dropped sharply. Messi was a deflated figure as he pulled off his captain's armband and trudged off the pitch in Kazan, walking into the tunnel without a glance back following a thrilling 4-3 defeat by France. He had given everything - providing two assists in an encounter full of passion and drama - but it was not enough. 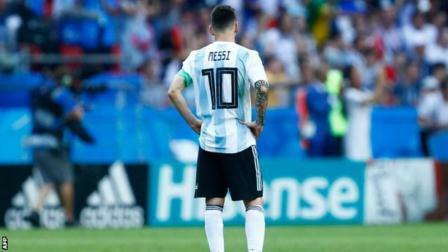 German World Cup winner Jurgen Klinsmann claimed Argentina "never managed to find Messi", who once again carried his nation's hopes throughout a turbulent campaign. "He was isolated in the first half, and in the second half he hardly had a touch." Argentina certainly failed to provide the service Messi so regularly enjoys at Barcelona. He had just four touches in the box and only one shot on target against France. When Ronaldo curled in that sensational free-kick to complete his hat-trick in a 3-3 draw against Spain in Portugal's opening fixture, you wondered if this tournament - and the Golden Boot - might be defined by the reigning Ballon d'Or winner. He carried his blistering form into the victory over Morocco, but missed a penalty - and might have been sent off - in the draw with Iran that took them through to the knockout stage. And, like Messi, he could do nothing to help his side avoid defeat in the last 16, as Edinson Cavani scored twice in Uruguay's 2-1 win. So is this the end for Ronaldo, a European champion in 2016, at international level? Portugal boss Fernando Santos insisted afterwards his captain "still has a lot to give to football" and may not yet be ready to retire from the national team.